Delayed Financing allows real estate investors to purchase properties for cash, then finance the property to get cash out which can result in higher profits. Delayed Financing, often called a Buy & Refi loan, can be utilized by individual homebuyers and investors alike, but in this article we want to specifically address real estate investors. For specific details concerning Delayed Financing, including loan amounts, see our blog: 5 Things You Should Know When Considering Delayed Financing for a House. Delayed Financing can greatly benefit real estate investors who have the cash to purchase and rehab a property, allowing them to finance the following day to leverage their cash and turn it over more quickly. 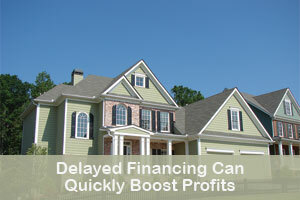 What are some advantages of Delayed Financing? Investors can purchase a property at a lower price for cash, then finance the property to get cash out. Investors can purchase a property for cash that does not qualify for financing, rehab it, then finance the property to get cash out. Investors can purchase a property for all cash to beat out the competition, then finance the property to get cash out. Investors can purchase a property for cash and get it on the market more quickly, then finance the property to get cash out. It’s no secret that real estate investors who are cash buyers are preferred by sellers and typically get a better price, save on closing costs, and have the potential to make higher profits. Cash buyers can also increase profits because of the ability to close more quickly, and get the property on the market more quickly. Delayed Financing, therefore, is a tool real estate investors can use to boost their profits by using cash to purchase and rehab an investment property, then finance the property on the back end to get cash out. At Marimark Mortgage, we specialize in Delayed Financing as just one of our mortgage products for real estate investors. If you are a real estate investor and would like to investigate investment mortgages or apply for a mortgage, please contact us via email or telephone.